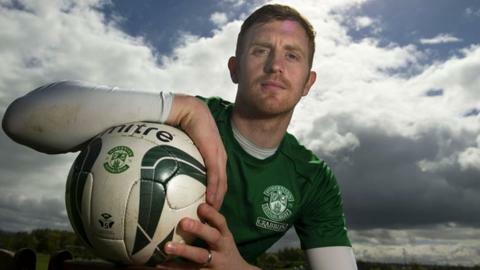 Starting their relegation showdown against Kilmarnock a point behind will give Hibernian the advantage at Easter Road, according to Hibs' Liam Craig. The Hibs captain thinks they will have the more positive attitude as they must win in order to avoid a play-off while the visitors need only draw. "If we are drawing going into the last half hour, I can guarantee they will get deeper and deeper," he said. "They won't be going all out for a goal, that's for sure." Kilmarnock manager Allan Johnston, whose side ended their run of four defeats with a 1-0 win over St Mirren on Wednesday, has insisted they will not play for a draw. But Craig thinks a big home support will also give the Edinburgh side, who slipped to second-bottom spot after a run of 12 games without a win, an advantage against the Ayrshire side. "With the fans at Easter Road, who have been excellent all season and especially over the last few weeks, behind us, we really believe we can do it," said the midfielder. Hibs reached safety from relegation two years ago after beating relegation rivals Dunfermline Athletic 4-0 in their penultimate game of the season. Matt Doherty, Eoin Doyle and Garry O'Connor all netted inside the first quarter of an hour at Easter Road as Pat Fenlon's team got off to the perfect start against the shell-shocked Pars, with Paul Hanlon then adding a fourth late on. Three players remain at Easter Road from that side and Craig revealed that they have been recounting their memories to psyche up the rest of the squad ahead of Kilmarnock's visit. "We've spoken about that game already this week," said Craig. "Lewis Stevenson, Paul Hanlon and James McPake all played that night and said the crowd that night was amazing - one of the best atmospheres they have played in. "It would be nice if we were 3-0 up after 15 minutes like they were that night. "But the fans did make a difference that night and I know that you do react to the fans and the noise they make. "So hopefully we can get a full house tomorrow and get the result they are looking for."